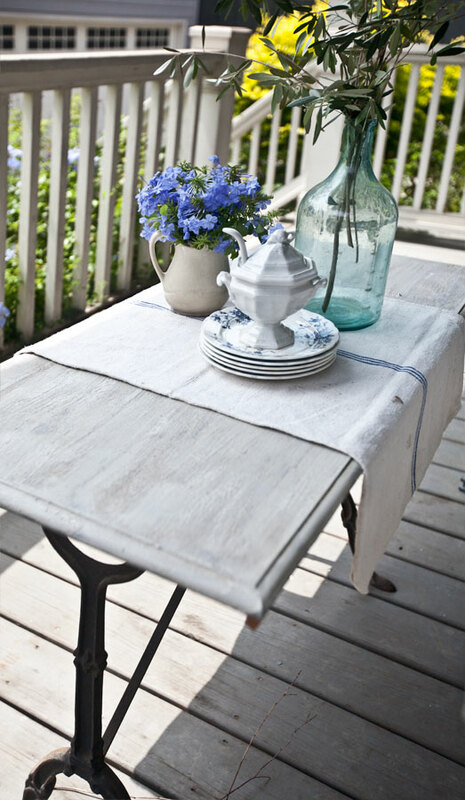 Dishes, especially vintage looking dishes are sure to give your home farmhouse French feel. I have loads of pictures, so let’s see what we can get through. 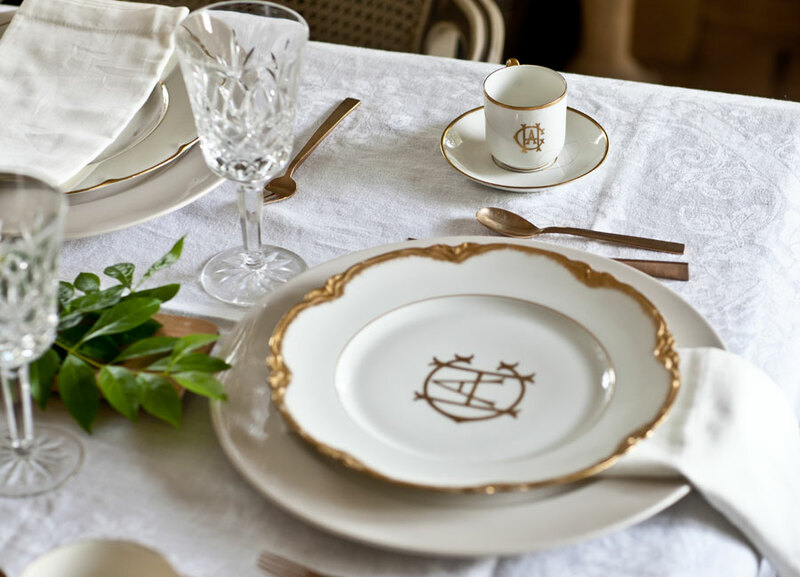 These first dishes are Haviland Limoge from France. They are so delicate. I think they are from the early 1900’s. You can see more of these dishes HERE. These dishes are also French, but much newer. This is an assortment of new dishes and vintage ones. You can see this tablescape HERE. This blue and white plate is very old and English. These dishes are all old except for the crock with the cow on it. This table was set with a mixture of dishes. 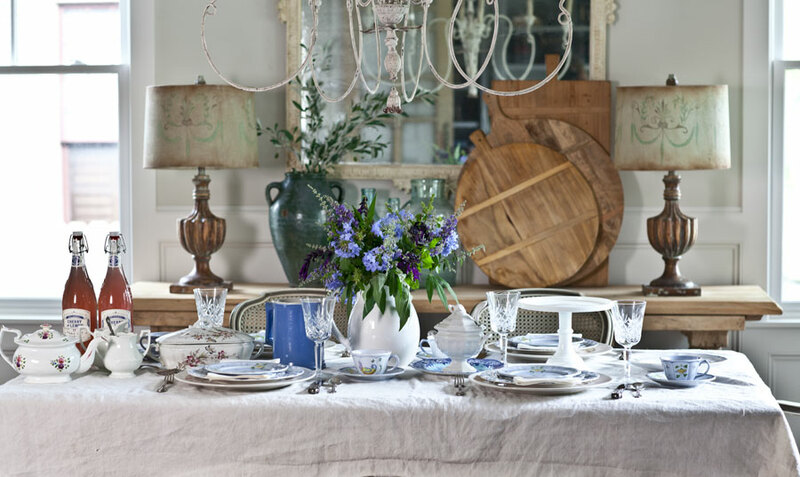 Stick with one or two colors when you set your table and you can mix many different dishes with ease. You can find this table HERE. I tried to keep dishes out of the living room, really I did, but they kept creeping over here. They spill out onto the porches some days. They even end up in our bedroom. The butler’s pantry is mainly where I store the crystal, but there are a few dishes in here also. 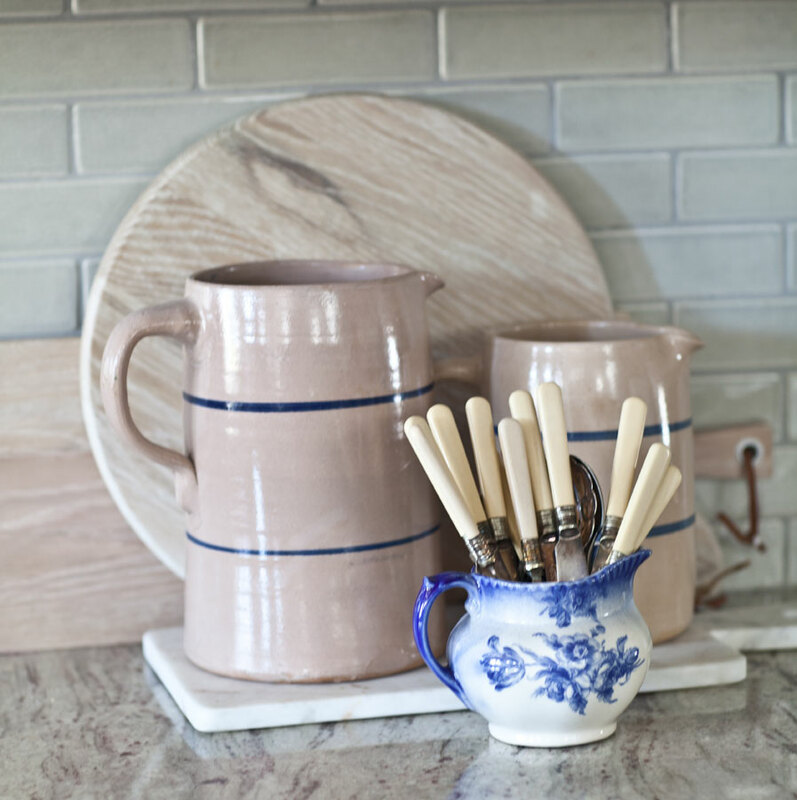 Jars, creamers and pitchers are great for organizing cutlery. Of course I had to buy the CHA dishes. I believe the CH stands for Charles Haviland, and I’m not sure about the ‘A’. But I like to pretend they were custom made for Anita of Cedar Hill Farmhouse. It’s so important to have an imagination, so you can enjoy life. You can see this table HERE. Here I’ve put dishes in the bedroom again on the walls. I get complaints from readers who say they don’t belong in here. If they bother you in the bedroom, then don’t put them in your bedroom. I happen to like them in here, so mine are staying. My job is not to convince you that my way is the best way. My job is to offer you ideas and hopefully to inspire you. Even if you don’t like the plates in here, then maybe it triggered an idea that will work for you. I share my plate hanging tip HERE. Of course I have scads of dishes in my kitchen. The dishes used to be all colors of the rainbow. If you want to know what happened, you can find that info HERE. I love displaying dishes everywhere. Here I’ve displayed dishes in an old armoire I converted to a china cabinet. Well I hope you enjoy your dishes. And I hope you have them out on display and you are using them! If they are in a box, then what’s the point of having them? 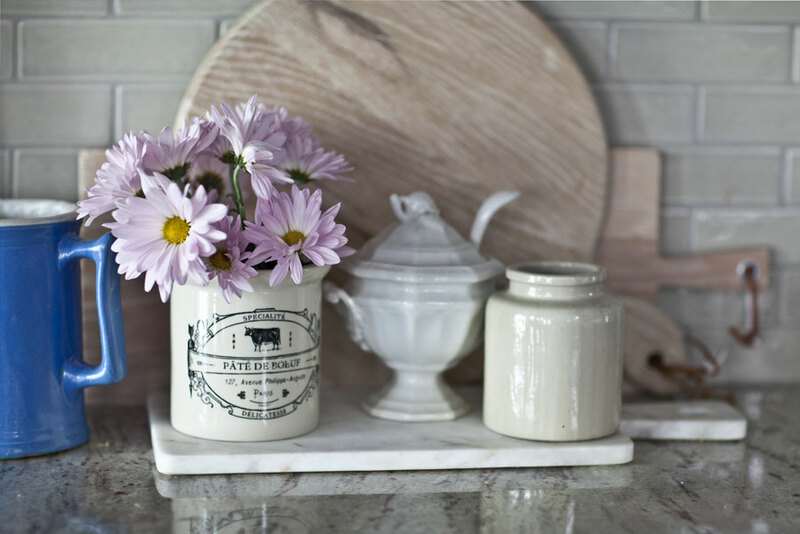 If you want to see the other posts in this series, you can find all of my Farmhouse French Friday tips HERE. Happy Friday! I find it hilarious that someone tried to tell you what you should put in your bedroom. Love your tips and I have your book. Oh yes Wendy. I really don’t mind though, if it is done politely. I too love dishes,and I can top you. I have them in my bedrooms AND MY BATHROOM! I call it creative art.? I have a cute creamer and sugar in my bathroom as well. 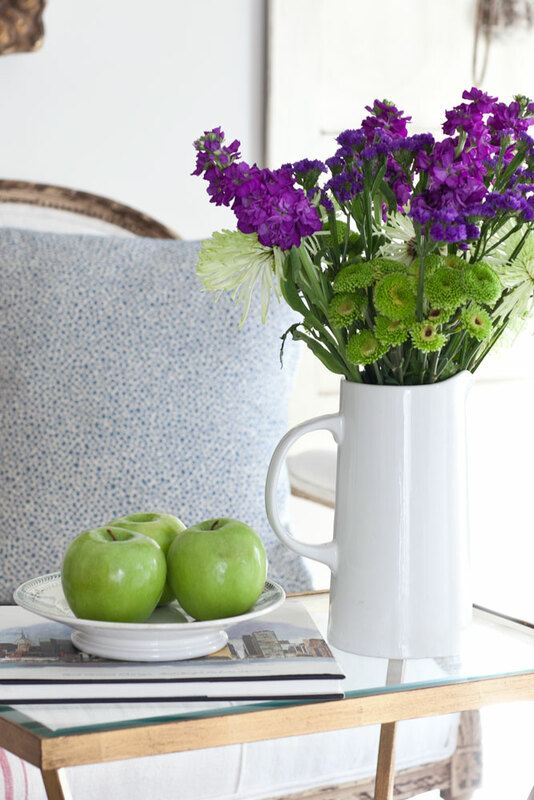 The violets on them add that finishing touch to the pastel colors in the room. Dishes everywhere every time! I think you use what you love. 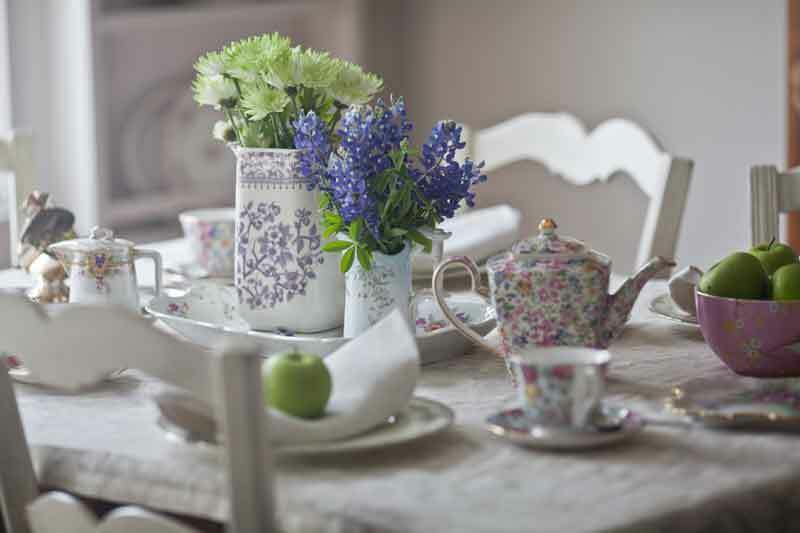 Really,in everyday decorating, it is what appeals to us and makes us happy! I love and collect dishes as well. Thanks for all your ideas and how to decorate with dishes. I loved this post! I love my dishes and love to decorate with them. I also love the plates displayed in the bedroom. I think they look beautiful with the French mirror. I hope that you have a wonderful weekend!!! Thank you Shannon. Glad you enjoy your dishes; I am sure they are gorgeous. Ah, this post is so resonant with me! I, too, have so many dishes, both old and new and I just love seeing your collection and where you display them. So very lovely!! Thanks Lory. I know we share a deep love of dishes. WHAT??? Someone really told you where to put (or not put) your dishes?? I personally think they look awesome in your bedroom; all your rooms are gorgeous–I wish I had HALF your talent! Like you always say, we need to do what makes each of us happy. Have a great weekend!! Oh yes. I usually hear about it when I am ‘wrong’. To each his own, right? Or in this case, her own. Thanks for the sweet compliment. I’m going to be on the naughty list. I have a very old platter that was my grandmothers on display on a wall. She passed when I was eight. I wanted it in an important spot. It gives me a memory. Oh it sounds lovely Cindy!! That’s a lot of dishes, dear friend! I have edited several collections of dishes recently. I wasn’t using them any longer and I find that as I edit, my taste are changing, somewhat! Thank you for sharing all the lovely dishes. P.S. 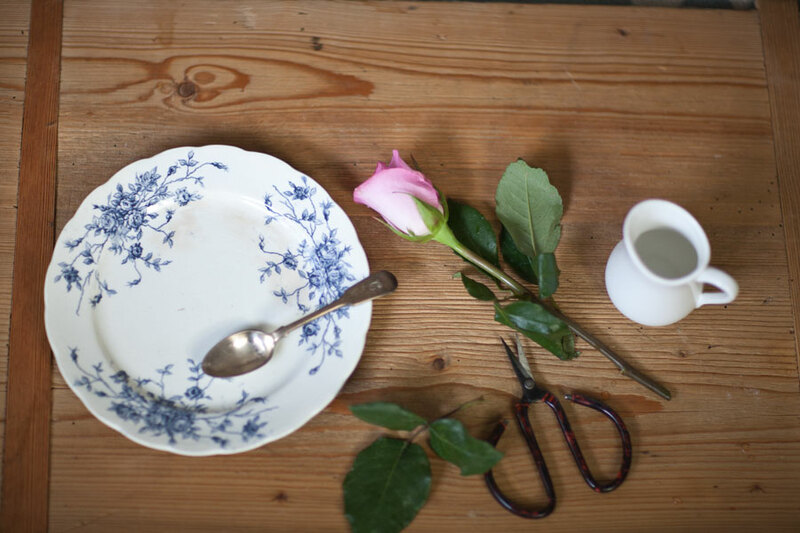 I use to have “rose” dishes on the wall in our Master Bedroom. I have taken them down as “Mr. Ed” and I are doing a more gender neutral bedroom. . .still a work in progress! Well it’s their house too. Way to be a team player Pat. OH, darn that creeping china!! Haha. I have to go and rearrange a China cupboard…. In the living room. Can’t pass up a beautiful old plate! Love your hutch and dish colkection…!! Awesome decorating! I knew we were kindred spirits. I also have too many dishes. I just refinished an antique china cabinet in black chalk paint to hold my Haviland-Limoges china. 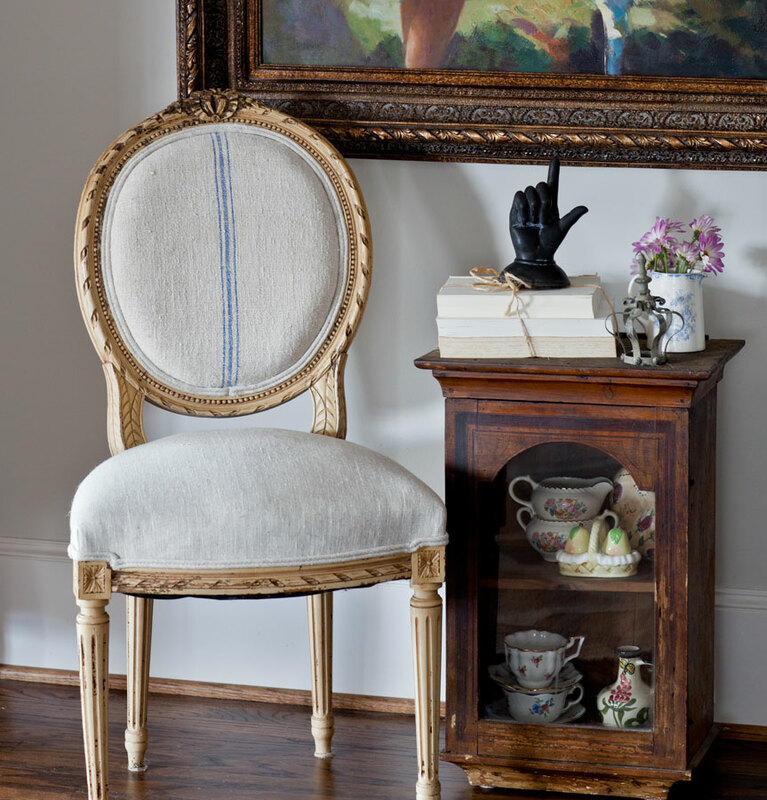 My mother bought it at the Haviland factory in Paris while my Dad served in the Army overseas. I have used your tips many times. 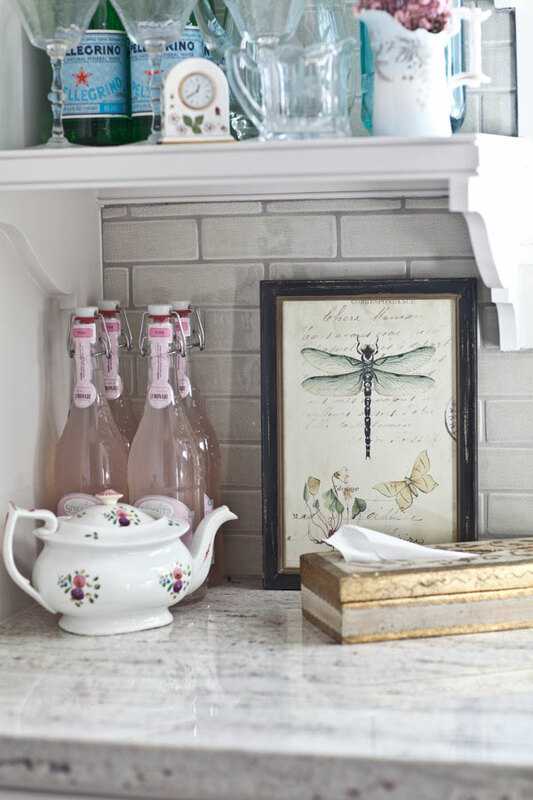 I am working on a country french bedroom and already have a tea set on the dresser and am putting up a small cabinet on the wall that I think I will fill with dishes! Thanks for the great ideas. Thank you tips and show/tell how to decorate with dishes. I clicked onto this post, because I have problems doing just that. I appreciate you showing me how to solve my uncertainties. Love this post! 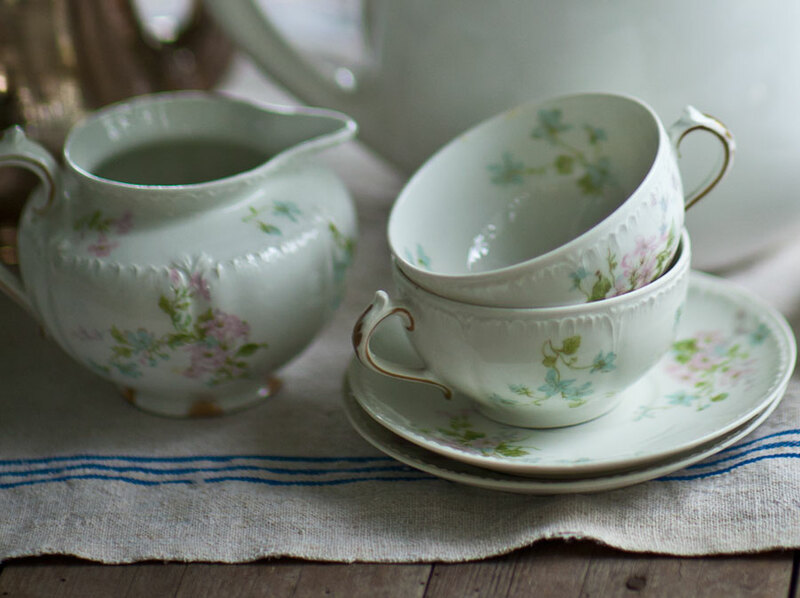 I have so much of my grandmother’s French China, but never knew the possibilities of what I could do with it. Now Ihow a treasure chest of new ideas…thank you! Thrift stores are great places to find wonderful vintage dishes…Alway room for one more! 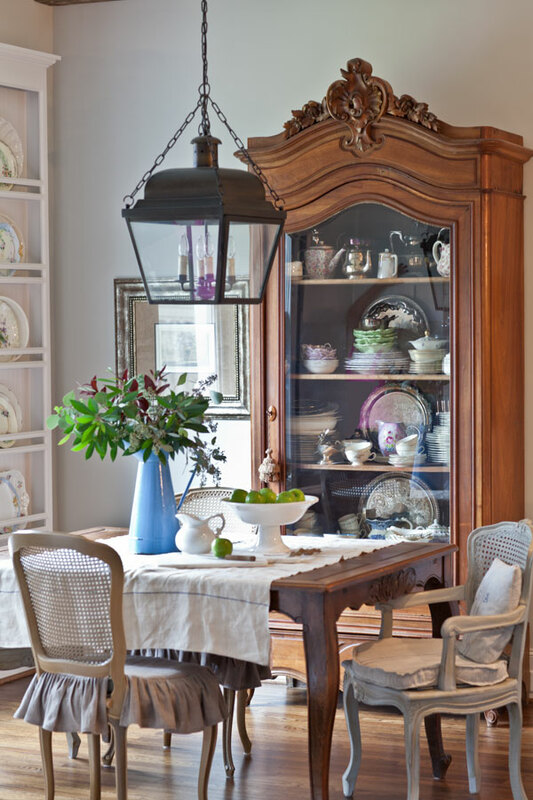 Our beloved designer of country French, Charles Faudree, used dishes upon the walls of any room. He had the perfect touch !! Love that you use dishes all over the house. If there’s a spot they will fit, put them in. 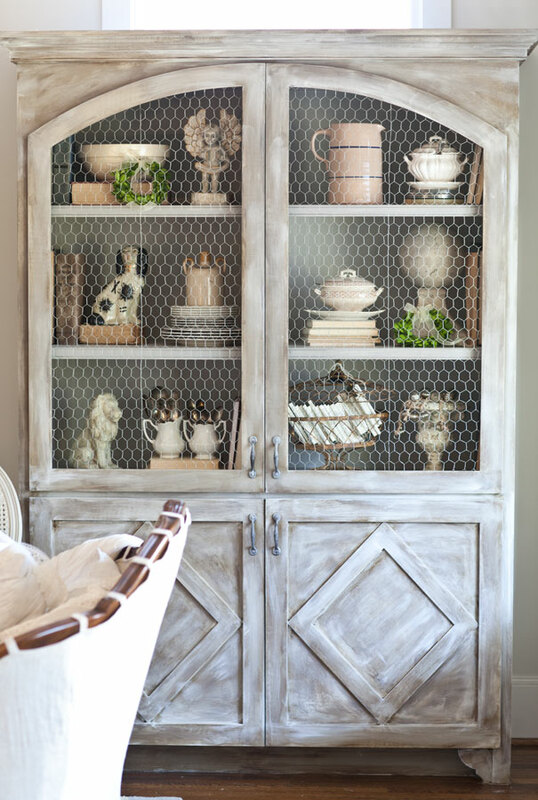 I don’t have a separate dining room – so I have my beautiful chicken wire cabinet in my livingroom displaying all my beautiful White Dishwear. I love the way you set up your dishes in your cabinet too. I love dishes, especially WHITE! Thank you for all your tips (both posts today), and just for being so prolific, and putting forward so MANY ideas. I also re-read your book this week, and want to contact you at some point to consult again. Loved your post about “where to shop for” X. You give me so many ideas. Thanks so much!!! We must be soul sisters! I have dishes everywhere too including the bedroom. Enjoy! How can we not use those beautiful dishes everywhere!! That would be the question! Love everything you do, so beautiful. Love your post! 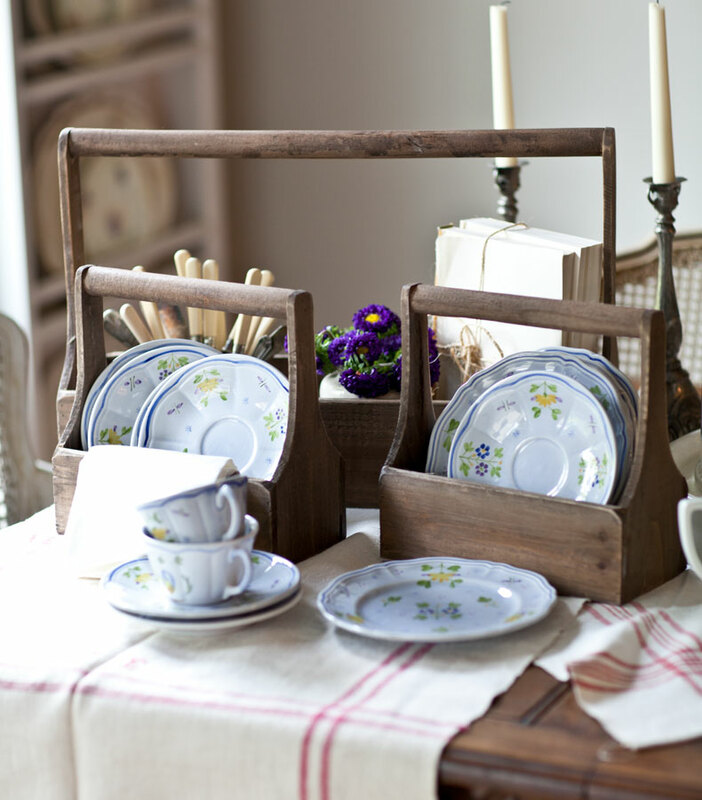 I have lots of dishes and I’m going to get busy using them to help me with the French Country look! Your decorating is beautiful and very inspiring! Thanks! 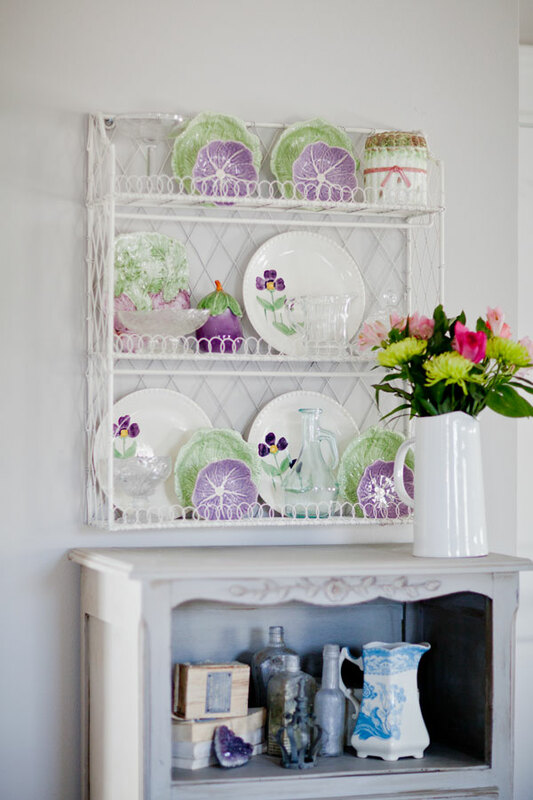 I love all your different dish displays – and I love dishes in the bedroom too! Oh my goodness, you have once again struck a cord with me. I too have a dish fetish. My husband does not understand. I recently purchased a box of old English blue and white dishes for $20.00! The only thing missing were cups, but that too is fine. They remind me of your plate you pictured of the blue and white English piece. But then it led me to having to purchase a chine cabinet for my kitchen to display the in. Does it ever end? ? Wonderful post! I always get ideas from you, Anita! Thank you! I love decorating with dishes. Mine are not antiques or special but if I like the colors and motifs I buy them, mostly from thrift stores. I think dishes are perfect pieces of art and great for any room. I too have many lovely dishes, from both my and my husband’s grandmothers, to my mother’s, and all that I couldn’t resist buying myself. Thank you for your fun posts, Anita! Anita, I want to inquire about the shades on the lamps in the dining room. Where did you get them? Are they old? Did you make them yourself? I love dishes also and I think you can put them wherever you want. Anita, I so appreciate your attitude of surrounding yourself with things you love and not dictating rules of style but inspiring others to be creative. I think there is a big difference between enjoying things and worshiping them. Love your ideas!!! China has been part of bedrooms for many centuries. The wash basin and water pitcher. Love your ideas. 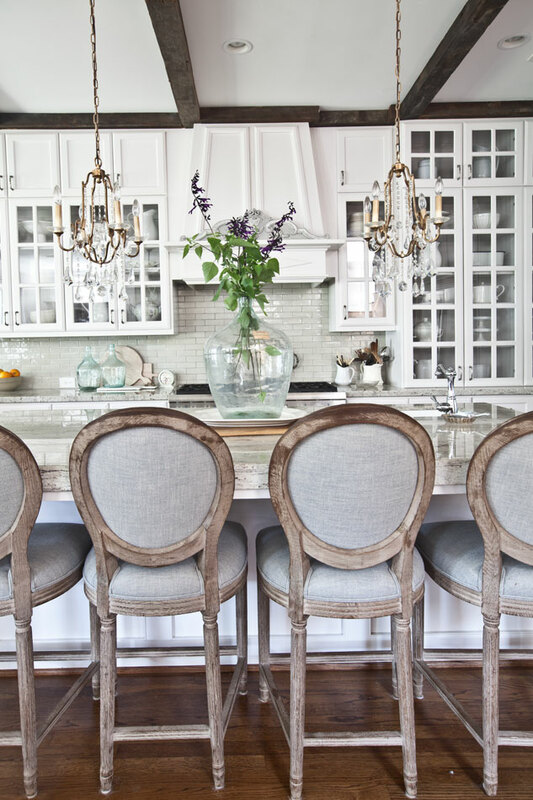 I love the kitchen Island pendants. Where are they from? Charmaine, I am not sure which ones you are looking at. If it is the 3 mercury glass ones, that is not my house, so I don’t know. I absolutely love your bar stools!!! Where are they from?? I’d love to get them. Nichole, they are from Restoration Hardware. Anita I enjoy seeing your collection of dishes. You have a beautiful variety. Using them everywhere is great. I did get this idea from you. It gives me something I enjoy around every corner.